This year’s flu season is shaping up to be the worst in recent memory, with the New York State Department of Health reporting a record-breaking 11,683 laboratory-confirmed cases of influenza across the state just in the past week. Despite this, some Stony Brook students are still holding out on getting the vaccine that could help protect them. “There are about 26,000 students on campus, but only 19,000 got their flu shot,” Dr. Rachel Bergeson, medical director for student health services, said. Olga Aristova, a freshman economics and applied mathematics and statistics major, said she had heard about the severity of this year’s virus, but she still had no plans on getting vaccinated. Aristova also raised concerns about whether the vaccine actually works or not. “This year it’s not very effective and that’s part of the problem,” she said. 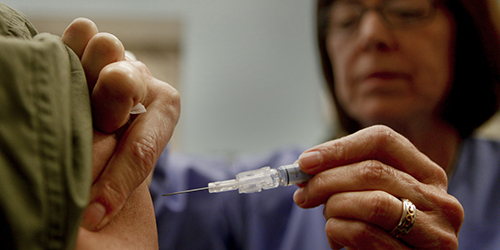 The Centers for Disease Control and Prevention has taken steps to make the vaccine stronger. For instance, this season’s vaccine protects against four different strains of the virus, whereas last year’s only protected against three. A recent study published in the journal Eurosurveillance found that the shot was only about 10 percent effective in preventing the most common flu strain in the U.S.. Even if the shot fails to protect against the virus, doctors recommend getting vaccinated anyway because it can cut down on the duration and severity of the flu. This may help patients avoid hospitalization, or even death. He went on to include a list of preventive measures including washing hands with soap and water, refraining from sharing drinking glasses and utensils and frequently cleaning your living quarters. Those who have already been infected should take additional precautions to prevent the virus from spreading, Bergenson said. “Patients should cover their mouths if they’re coughing or sneezing. If they’re feverish they should stay home,” she continued. For students and faculty who have not yet gotten their flu shot, Bergenson said that the vaccine is available for free on campus, but that supplies are limited. Those interested in getting vaccinated can visit Student Health Services Monday through Friday from 8 a.m. to 12 p.m. and 1 p.m. to 5 p.m., or the Campus Recreation Center on Tuesdays and Thursdays from 12 p.m. to 4 p.m.